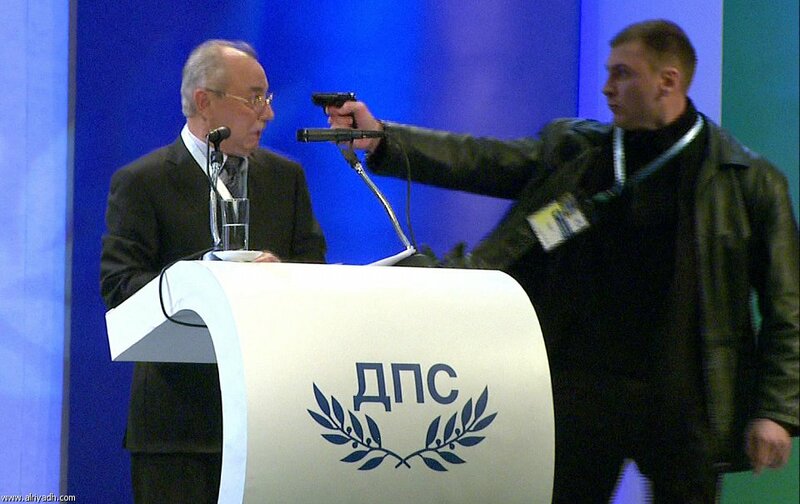 A gunman reportedly attempted to assassinate the leader of Bulgaria’s Turkish ethnic party during a televised conference on Saturday. The leader of Bulgaria’s Movement for Rights and Freedoms (MRF) party, Ahmed Dogan, was assaulted by a gunman while on stage at the National Palace of Culture (NDK) in Sofia, according to the Sofia Globe. The assailant, 25-year-old Oktai Enimehmedov, climbed onstage and held a gun to Dogan’s head, but the gun reportedly got stuck and was unable to shoot. The Times also reports that the gun appeared to misfire, giving Dogan enough time to bat away the gunman’s arm before he was assisted by security guards. Dogan and the gunman wrestled on stage before security raced to apprehend the assailant, amid loud boos from the crowd, according to The Sun. Along with the gas pistol, Enimehmedov was also armed with two knives. The Bourgas native has two prior convictions, including causing bodily harm in 2006 and drug possession in 2010, the Sofia Globe reports.